Lakeside’s music program provides students with opportunities from picking up an instrument for the first time to growing into accomplished ensemble players and soloists. The program is a place where students can make lasting friendships and explore how music connects people from around the world. Our music faculty and coaches are dedicated teachers and active performers with connections to the larger music community. In ensemble settings, teachers provide regular feedback to students that helps them develop good musical skills and habits, and increased proficiency in their chosen instrument. Faculty regularly bring in local and nationally recognized musicians, composers, and conductors (including Lakeside alumni) to conduct masterclasses and even just play beside students. All students are welcome in the music program regardless of previous experience. Students have an opportunity to play in different kinds of ensembles at a level that is appropriate for their experience. To help students develop to their fullest potential, Lakeside offers private lessons on almost every instrument. The cost of private lessons is not included in tuition; however, financial aid does apply. Lakeside’s Middle School is unique in the resources committed to the music program, which is open to all students. All 5th grade students learn to play a string instrument through small group instruction and participation in a string orchestra. Starting in 6th grade, students choose which performing art they would like to study each year. Sixth-graders can choose between a beginning band, a combined drama/choir class, and orchestra. In grades 7 and 8, students choose between yearlong classes in band, choir, drama, and orchestra. Performing arts classes take place four times a week, which gives students time to learn and develop new skills. Beginning courses teach students the fundamentals necessary to participate in bands, choirs, and orchestras – such as how to read music, follow a conductor, and work together as an ensemble. Intermediate to advanced classes provide opportunities for students to develop their technique and gain performance experience with a variety of repertoire. Learn more about the Middle School music program in the Middle School curriculum guide. 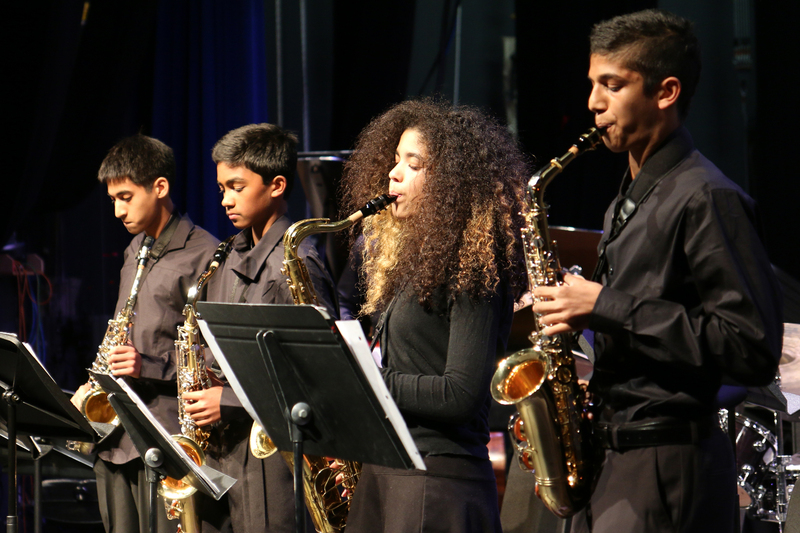 Upper School music ensembles are accessible and engaging for both beginners and seasoned performers. Students have a wide range of opportunities to learn an instrument, perform in different types of ensembles, and develop high levels of musicianship in the area of their choice. Courses emphasize group collaboration and achievement, critical listening, and an appreciation for a wide range of repertoire. Lakeside offers multiple ensembles, including concert band, concert choir, jazz bands, symphony orchestra, and chamber groups. Choir students develop healthy vocal techniques and habits as they learn repertoire in a variety of languages, origins, and styles, including classical, jazz, and gospel. Instrumental musicians develop advanced technique as they perform a wide range of repertoire from baroque through modern composers. Advanced music students can do senior projects that include a concerto competition, composition, conducting, improvisation, and leadership in the community. Formal auditions are not required, but students in instrumental groups should have some prior experience playing an instrument and the ability to read music. Students are grouped according to experience and instrumentation. All music ensembles perform four or five concerts annually. Additionally, students in the music program regularly participate in workshops, competitions, and regional festivals. The program prepares students to participate in music at the college level, and students have gone on to have professional careers in the arts. Learn more about the Upper School music program in the Upper School curriculum guide. Hear the Upper School orchestra performing excerpts from Haydn's Cello Concerto No. 1 in C Major (with cello soloist Julian Schwarz '09) and Brahms's Symphony No. 1 in C Minor at Benaroya Hall in January 2017. Hear the Upper School choir performing excerpts from Mozart's "Ave verum corpus," and des Prez's "Ell Grillo" at Benaroya Hall in January 2017.